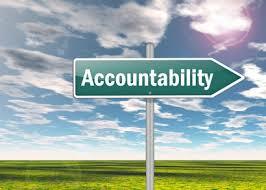 Accountability – Do We Owe It? Personal accountability seems to be at an all- time low. Do you agree? Owning our actions, our words and every aspect of our daily lives seems to be tantamount. For everything that goes wrong in our lives, we seem pretty quick as a society to cast blame outwardly. 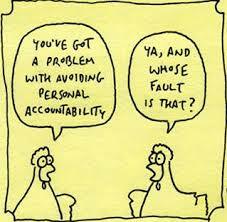 Perhaps, it is time we start to reflect inwardly and own up to our personal responsibility for holding ourselves accountable. My intention is for this to be a several part series as accountability applies to many components of our lives: from work, to health, to our children, and to each other as a society. My first post hits a sensitive nerve on a topic way too close to home: our health and cancer. Nod your head in agreement as I casually comment on how the cancer diagnoses seem to be rising; or rather, how you know of this one and that one who has battled or is currently battling some form of cancer. Yes? Of course! Even though I am a cancer advocate, I am meeting someone new each week – EVERY @#$&%@ SINGLE WEEK – to whom I am introduced to by someone who wishes for me to offer the “been there, done that” spiel to their friend, their neighbor, their colleague, their aunt, or even themselves. Personally, I am beyond frustrated as each year BILLIONS of dollars are poured into the various cancer fundraising vehicles….and yet, every week as I mentioned above, I am talking to *new* people with cancer regularly. The so-called quest for a “cure” makes me even more nuts as I do not believe the solution is on the horizon. I wish for the scientists to continue looking for the elusive piece of the puzzle, but in the meantime, what do we do *NOW*? Why are we not talking about the responsibility we owe ourselves in ensuring our good health? What is *CAUSING* these seemingly higher incidents of cancer? Why are we not looking for the root cause just as much, if not more than, the cure? Whereas I do not wish to get into a scientific debate here, I simply want people to recognize the power of accountability. If we know something carries a higher risk of causing cancer, why do we do it? Why do we not take a more preventative approach to better health? Why do we take our bodies for granted? Prior to 2007, I was one of those people who took my health for granted. I most certainly did. I was barely into my thirties at the time, why would my health even be on my radar aside from regular physicals? Did I ever stop and think about what I put into my mouth? Sure, when I felt my love handles being more than a handful or when my folds of my stomach climbed upward into flabalanche status. I thought more about eating healthier for a few weeks at a time, but purely for the sake of losing weight for vanity sake. I never once thought about extra weight putting me at a higher risk for breast cancer. Wasn’t I too young? Did I worry about microwaving plastic, melamine, or using other modern day items of convenience, including Styrofoam? Why would I? I was much too busy and chaotic to worry about things that made my life faster, quicker, more convenient, more on the go and just *easier*. Why would these things possibly impact my health? Did I think about the lotion I rubbed vigorously into every inch of my skin post-shower? No. Why would I? I smelled good and my skin was soft. Did I think more about the different face cream I smoothed into the creases around my eyes or my smile lines? No. What about the cleanser I used at the end of the day to remove my make up? Who cares what ingredients were in all of these different products? Did I worry about the stress in my life? Sure, sometimes I did but not as a Mack Truck about to steamroll my very core being into a fight for its life. When I thought about the often times incapacitating stress in my life; I did not picture being able to make choices to *fix* my chaos, I only daydreamed about an escape…..or more so, a *time-out* so that I could focus on just me for a moment. Was it all the McDonald’s, Bagel Dogs and ramen noodles I ate in college? Was it the chemicals I was exposed to all the times I spent hanging out with dad at his construction sites? Was it the mercury I used to roll around in my hands after breaking an old-fashioned thermometer? Was it all the body care products I used that were chock full of parabens? Was it the insane amount of stress I was under from a ridiculously demanding job coupled with being a care-taker to my aging and high-maintenance parents while managing my own young family? I will never know the precise *trigger* of my cancer and I am okay with that. However, I now know my health really begins with ME. I have to be accountable and held responsible for ME. My children have a much higher rate of disease now, thanks to my diagnosis. I want to enable all three of my kids to be pro-active and make better choices than I was ever equipped to make. I want my friends to be pro-active instead of reactive. Why go through the horrors that I did? Having watched my best friend go through a much different cancer battle in the past year makes me want to SCREAM this at all of you! Do we not owe ourselves some level of accountability? If we knew a battle lies ahead, wouldn’t we run out and get whatever weapons we could in our arsenal, to help us protect and defend our home lines; the very place where our most beloved reside? Of course we would! Why are we not using the same concept with our bodies and our health? We *KNOW* that eating a palate of fresh vegetables, clean meats and plentiful amounts of water are ideal. We *KNOW* that regular exercise is good for us. We *KNOW* that exposure to certain chemicals increases a multitude of health concerns and issues. We *KNOW* that stress wears us down, makes us sick and causes friction in our daily lives. Where’s the accountability? What can we do to effectuate change *BEFORE* it is too late? For me, I do not want to get cancer again so my changes have been pretty dramatic. I want my children to learn from me now, post 2007-2008 and post-cancer. I want my babies to be equipped to make better life choices than I ever did. Will they? I do not know but I want them to have a balance. Yes, Slim Jims are disgusting and totally unhealthy for you. However, having an occasional Slim Jim through-out the year will not cause extensive damage because you are eating your healthy nutrition all the other times, coupled with regular exercise, stress maintenance and using the lowest possible chemical exposure on top of it. For you, promise me that you will *think* about your accountability here and there. Give yourself a handful of reasons why you should be pro-active when it comes to YOU! We live in a fast-paced, uber-convenient society that takes nearly every luxury for granted. Find five…….. (5)……only five (!) ways you can be more aware in your life. What matters most to you or what is easiest for you to own accountability for in your life? Check your grocery cart before checking out. Are there any products that you can find a better version of that has less processed or chemical ingredients? Maybe you do not need that product at all. Read your labels. Check your personal care products. Find safe products or perhaps find ones that will work for you with less toxic chemicals. What are your children using? You will find them safer products, right? Read your labels. Check your exercise routine. You do not have to be all insane and crazy like some people we know. (Ahem, are you looking at me?) Even if you *despise* exercise, there are so many ways to incorporate a little more in your daily life: park further away, take the stairs, or find a friend to take a walk with before you share that bottle of wine. 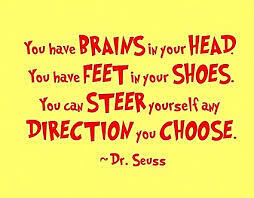 What works for you that you will create a habit of? Check your daily stress. Many of us feel trapped and unable to make a change. Sometimes, a lower paying job or reducing the household bills will make all the difference in the amount of stress taxing you on a regular basis. Change begins with YOU. Find a buddy to help keep you accountable. Write your five goals down and share it with your spouse or your friend. When you hit those five goals, aim for five more and before you know it – you have made massive lifestyle changes and you are paving the way for your children, our future generations, to live in a *hopefully* healthier, less cancer filled world.